Homeowners have been refinancing revolving debt and credit card interest for decades. When property values are up nationally and the economy is roaring, mortgage lenders are willing to take on more risks and aggressive home equity programs are typically more available. If you have thousands of dollars in credit card debt, you may be having difficulty paying down the balances. Many home owners are only able to make minimum payments. This can make it almost impossible to pay off the principal in a timely fashion. Another problem is that most credit cards have a variable interest rate, so if rates go up, as they just did in June 2017, your credit card interest rate will go up. If you have several credit cards with high balances and variable rates, you can find yourself in a situation where it is very hard to pay off what you owe. But millions of Americans have equity building in their home. Many of them may be able to take out a home equity loan and pay off those high interest debts. Find out about all of the new home equity loan programs designed for refinancing unsecured loans and credit card debt. A home equity loan is considered a second mortgage lien that you take out on your home. It taps some or all of the equity you have in your property. With a home equity loan, you are taking the cash in a single, lump sum payment. This type of loan can be a good move for someone who needs to make a single, large payment. Those with a lot of credit card debt are good candidates for a 2nd-mortgage. 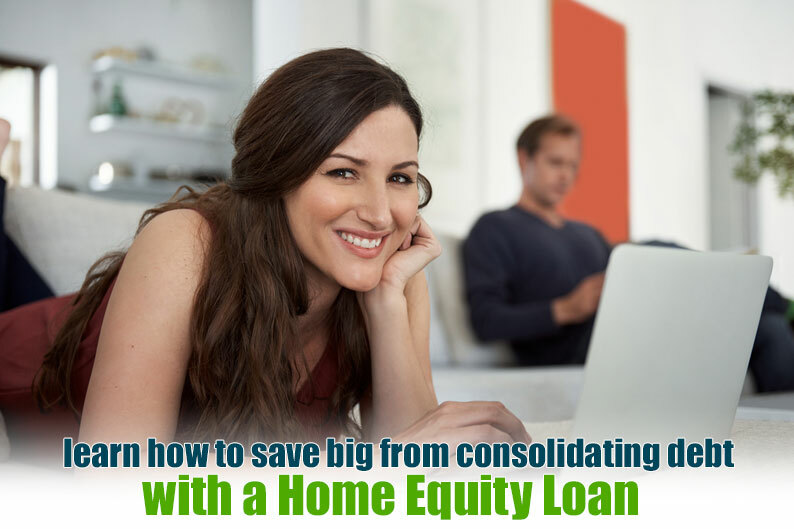 It makes sense to speak with a home equity loan lender. The interest rate on a home equity loan is low. It is not quite as low as your first mortgage, but you can expect a fixed rate in the 6% or 7% range if you have good credit and good debt to income ratios. The interest rate may be 10% less than your credit card interest rates. The reason for this is that the home equity loan is a secured loan, meaning that it is backed by your home. If you do not pay, you lose the home in many cases. The bank knows people do not want to lose their home, so in all likelihood, will do what it takes to pay off the mortgage. Credit cards and other unsecured debts have much higher interest rates. With a second mortgage loan, you can dump all of that bad debt and make a single, low interest payment each month. A huge advantage of holding a mortgage is that the interest you pay is normally tax deductible when you file your taxes. This can save you thousands of dollars in taxes paid each year. You cannot write off your interest on your credit cards or other debts in the same way. So, you can save big with a home equity loan – both with the interest rate and with the tax advantage. If you pay off your credit cards with a home equity loan, you will probably see your FICO score increase a lot. This happens because your credit utilization rate constitutes a full 1/3 of your credit score. Don’t be shocked when you pay off those cards if you credit score increases by 40 or 50 points. Having a higher credit score could improve your financial prospects; some home owners use their higher FICO score to get mortgage loans so that they can invest in rental properties. Yes, there are home equity loans for bad credit scores available but the interest rate is typically higher and often more equity is required. Rates have been actually dropping a bit in 2017, although they soon could increase after the Fed just increased rates on June 14, 2017. Still, you may be able to still secure a low interest home equity loan that will save you a lot in annual interest payments. Check Home Equity Loan Rates Today. It is possible that interest rates for mortgages will start to increase; the Fed has promised more interest rate hikes in the future, so you might want to talk to your lender today about an equity loan. A benefit of a home equity loan for some borrowers is that it is a fixed rate loan. You do not have to worry about the rate on the loan ever increasing. The fixed rate will be a bit higher than the rate on a HELOC or home equity line or credit which is variable. Still, many borrowers prefer to have the fixed interest rate because they know exactly what they have to pay every month until the loan is paid in full. Compare HELOCS and Home Equity Loans. We are no longer in a declining real estate market. Prices on homes are increasing, and equity in property is on the rise. This means that more people have potentially more equity available that can be used to pay off credit card debt. A home equity loan is a good choice for many home owners to save a lot in interest payments each year. It also has major tax advantages each April 15 that make it an even better financial decision. Also, borrowers can clear off their credit cards and greatly increase their credit scores. If you are sure you will have the self-discipline to not go run up your credit cards again, we think that taking out a home equity loan to pay off debt is a smart move.